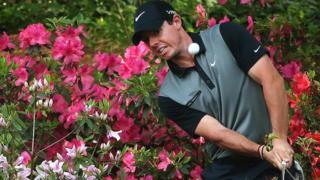 Northern Ireland's Rory McIlroy admits he is too far back to realistically challenge for the 2014 Masters at Augusta. He just made the cut after a disappointing 77 in the second round to lie 11 shots behind leader Bubba Watson. "It is going to be nearly impossible to make up so I am trying to shoot two really low rounds and see where that puts me at the end of the week," said McIlroy.